"Do not eat meat that has not been drained of its blood. "Do not practice fortune-telling or witchcraft. "Do not trim off the hair on your temples or trim your beards. "Do not cut your bodies for the dead, and do not mark your skin with tattoos. I am the LORD. "Do not defile your daughter by making her a prostitute, or the land will be filled with prostitution and wickedness. "Keep my Sabbath days of rest, and show reverence toward my sanctuary. I am the LORD. "Do not defile yourselves by turning to mediums or to those who consult the spirits of the dead. I am the LORD your God. "Stand up in the presence of the elderly, and show respect for the aged. Fear your God. I am the LORD. "Do not take advantage of foreigners who live among you in your land. Treat them like native-born Israelites, and love them as you love yourself. Remember that you were once foreigners living in the land of Egypt. I am the LORD your God. "Do not use dishonest standards when measuring length, weight, or volume. Your scales and weights must be accurate. Your containers for measuring dry materials or liquids must be accurate. I am the LORD your God who brought you out of the land of Egypt. Some people think the Bible is nothing but a book of don'ts. But Jesus neatly summarized all these rules when he said to love God with all your heart and your neighbor as yourself. He called these the greatest commandments of all (Matthew 22:34-40). By carrying out Jesus' simple commands, we find ourselves following all of God's other laws as well. For Jesus, this included loving the elderly and foreigners—people routinely overlooked and taken advantage of. If you don’t have close friends and if you don’t like your family, life will be cleaner. But you won’t get anything done in life – especially in regard to relationships. Let’s stop looking for perfection in others. Let’s drop our expectations that life with other people will be easy. Of course there will be conflict. Other people will get on your nerves and let you down and make you mad. Welcome to the human race. But we have to keep running in that race. Our world is upside down. We reward the wrongdoer and we chastise the righteous. To be good is equal to being somehow deficient. Words like (virtue), (purity), and (sweetness) have taken on negative connotations. To be good is foreign or alien to the majority. The key is not to give up. The Lord will reward those who persevere in the face of persecution and frustration. God loves the pure in heart, and it is well worth it to hold on for His sake. “He knows how we are formed; he remembers that we are dust” (Psalm 103:14). God understands that we are fatally flawed creatures, yet deems us immeasurably valuable no matter how crumpled and soiled we are. Paul wrote to the Corinthians, “But we have this treasure in jars of clay to show that this all-surpassing power is from God and not from us” (2 Corinthians 4:7). In Paul’s day, it was customary to store treasure in clay jars. The common container disguised its contents and didn’t draw attention to the treasure within. You and I might not look like much on the outside. 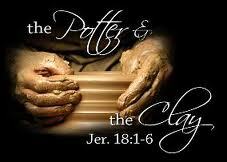 We may appear as common as jars of clay, but inside are hidden incredible treasures. Inside these old cracked pots reside the most incredible treasure of all...Jesus Christ. And that makes us valuable.